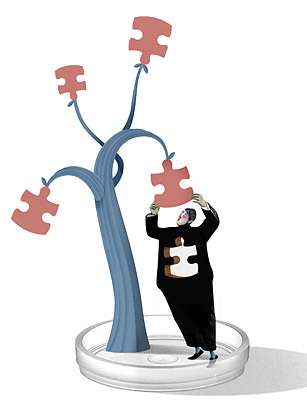 Treating disease is about fixing broken parts  about replacing cells that no longer work as they should, repairing tissues that falter and boosting systems that fail. But curing disease is a different matter. To cure disease, you have to do all of that and more. You have to remove the pathological cause of the problem and to ensure that it doesn't return. This requires teasing out where rogue cells went wrong and finding a way to nurture healthier ones to replace them. That's where the promise of stem cells lies. As the mother cells of every tissue in the body, they are the biological ore from which the body emerges. All cells can trace their provenance to a stem cell, to the embryo and the first days after fertilization when such cells form. It's now possible to grow stem cells in a lab, not just from embryonic tissue but also by turning back the clock on an already developed cell like one from the skin, bypassing the embryo altogether with four important fountain-of-youth genes that rework the skin cell's DNA machinery and make it stemlike again. These biological wonders are transforming the way we treat disease as well as how we think about unhealthy states and even the way we approach aging. Now that it's possible to generate an unlimited supply of stem cells from our own tissues, scientists say it's only a matter of time before they figure out how to turn those cells into nerves, heart cells, liver cells or any other living tissue we may need if we get sick or injured. Disease, therefore, no longer needs to be a black box of medical mystery. To expose what makes nerve cells in patients with Lou Gehrig's disease lose their ability to control muscle, for example, some researchers have already grown motor neurons from stem cells made from patients' skin and watched how they develop, at first normally, then veering off into pathology. Such a disease-in-a-dish strategy led to the discovery that it's not the motor neurons that are at fault but that other cells assigned the task of supporting these nerves turn toxic and break down the connections to muscle. With that insight, drugmakers have begun screening compounds to see if they can find an agent to block that lethal effect. Even when we already know what causes a disease, stem cells can help us improve on existing therapies. Stem cells may make it possible for Type 1 diabetics, for example, to eliminate their repeated blood checks and insulin injections by someday allowing them to generate their own insulin-making pancreatic cells. If stem cells can replenish the dying brain neurons that affect memory and cognition, Alzheimer's patients might also benefit. But why stop there? If these cells can replace ailing cells, why not aging ones? Can stem cells, as a source of replenished, renewable and healthy cells, keep us young forever? "In the absence of disease, why would we die?" asks Douglas Melton, a stem-cell researcher at Harvard University. "With stem cells, can we get control of the aging process?" There's tantalizing evidence that this might be possible, at least when it comes to blood and the immune system. Thomas Rando, a researcher at Stanford University, thinks stem-cell treatments may enhance healing in older patients who have difficulty recovering from surgery or a fracture. But he's also thinking about deeper issues involving the power of regenerative medicine. "There are very basic questions I hope we can make headway on using stem cells  in terms of understanding cellular aging, how that's related to tissue aging and the aging of an organism," he says. Which leads to the interesting possibility that with stem cells, we may no longer define age as how old we think we are but as how old our cells tell us we are. See our best shots for tackling our worst problems.